Gallup released their newest poll on abortion, finding that American attitudes towards abortion have mostly remained steady. 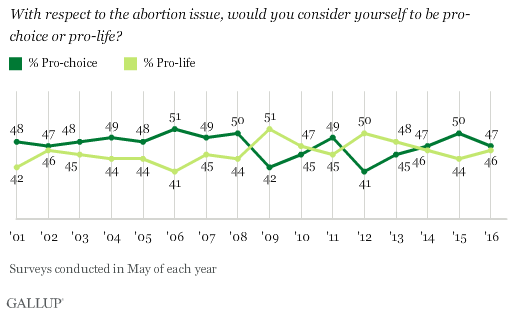 However, despite the very best efforts of the pro-abortion media, pro-life attitudes have increased. While the percentage of Americans identifying as “pro-choice” or “pro-life” is virtually tied, at 47 percent to 46 percent, respectively, the number of Americans identifying as pro-life has grown over the past year, while the number of Americans identifying as pro-choice has dipped. This time last year, 50 percent of Americans called themselves pro-choice; 44 percent of Americans felt they were pro-life —an increase of 2 percent. 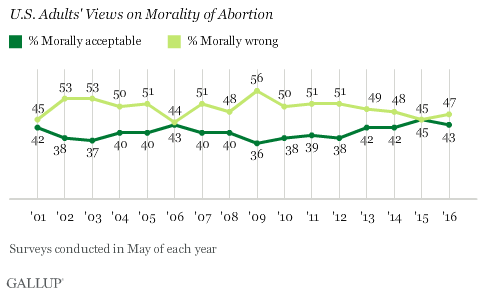 Meanwhile, more Americans feel that abortion is morally wrong. In a year, the percentage of people who felt that abortion is morally acceptable dropped from 45 percent to 43 percent; the percentage who felt it was morally wrong rose from 45 percent to 47 percent. Regarding the legality of abortion, those numbers remained steady. A majority — 69 percent — felt that abortion should be either illegal, or only legal under certain circumstances. 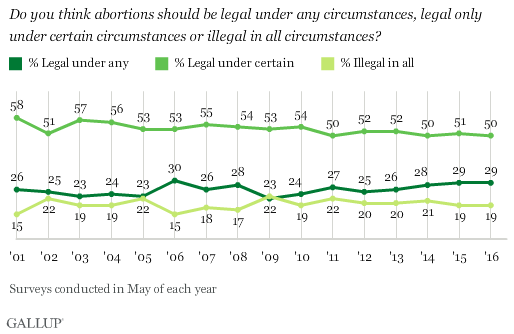 Only 29 percent of Americans felt that abortion should be legal under any circumstances. Gallup also further clarified that of the people who responded that abortion should be legal under some circumstances, 37 percent felt it should be rare, and only be allowed to occur under a few circumstances.